Fly away defleqt fly and insect repellent is HSE approved in accordance with new EU Legislation. The Defleqt fly and insect repellent is formulated from a natural formula of herb extracts that really work. 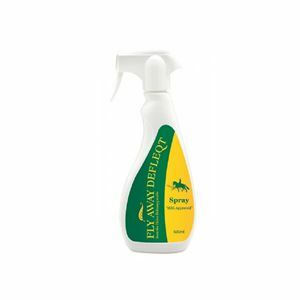 Ideally defleqt fly repellent is applied along the horse's back, tail, rump etc and other areas where flies are a problem for maximum effect. The herbal ingredients in this equine fly repellent also helps to improves coat condition and shine.